My daughter’s kindy has a no nut policy for snack time. It makes sense, however suddenly I am lost as to what to give her other than fruit and cut vegies. Normally I will also have a pot of nuts or I make bars for her with nuts and seeds. 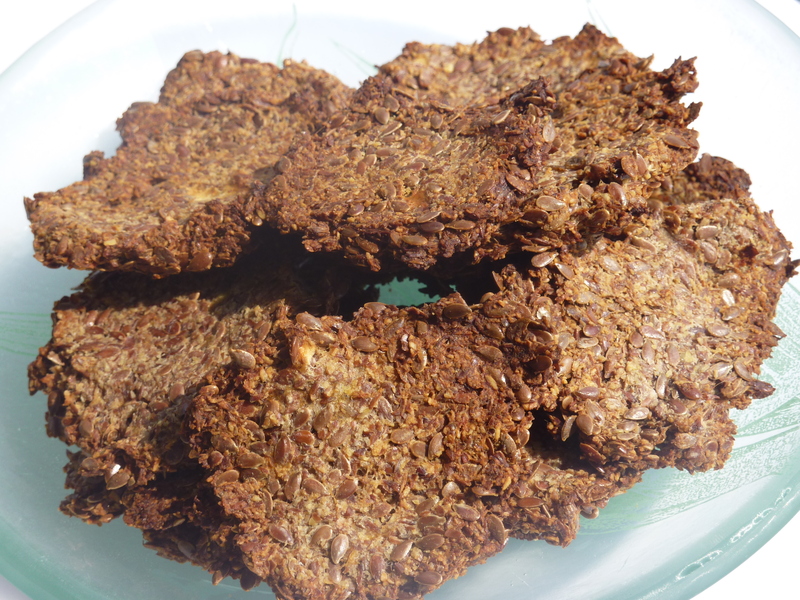 However I found a recipe for flax crackers and have tweaked it a bit (although for her ones at school I will just make 100g flax half whole half ground). These have the perfect balance of carbohydrate, protein and essential fats. Can be for snacks or spread with nut butter for breakfast. Also go very well with my Lemon, ginger and orange curd. 1 medium (browned or extra ripe) banana. Mash the banana with a spoon until its creamy with few lumps. Add the flax seeds, almonds and mix. Keep mixing till it completely combines. Let it sit for 20 mins. Grease a baking sheet with olive oil cooking spray, drop 1 Tsp drops and press flat. Bake for 15-20 minutes on 300C or until the edges are brown and the tops are hard.